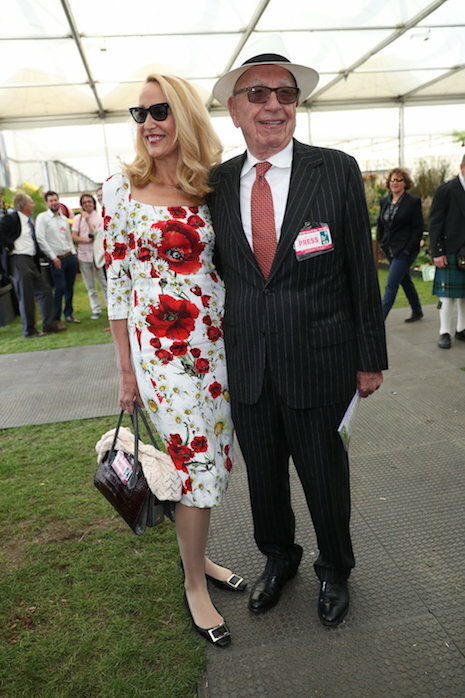 Rupert Murdoch and Jerry Hall flashed their press passes (just like the rest of us) to enter the fancy Chelsea Flower Show in London. Why would a media mogul worth 12.5 billion dollars need a press pass? Marriage seems to agree with our former boss Rupert – he and his bride Jerry look quite happy and appropriate together. The royal family was also present at the high society event on opening day, along with celebrities and florists…and media. She used to be so glamorous, since she married him she looks very frumpy all the time. Does she have to sleep with him too???? They seem so happy together. He is a man who likes to be married and she deserves to be treated with kindness and respect. A great match!